WASHINGTON — Congress approved a sweeping $1.5 trillion tax bill on Wednesday that slashes rates for corporations, provides new breaks for private businesses and reorganizes the individual tax code. The Senate passed the GOP bill early Wednesday morning and the House then voted on it for a second time to fix technical problems with the legislation, the final step before it's sent to President Donald Trump for his signature. No Democrats in either the House or Senate backed the measure. It is the president's first significant legislative accomplishment and the biggest tax overhaul in a generation. Trump, who praised the Republican bill as a "historic victory for the American people" at a Cabinet meeting Wednesday, is holding an event at the White House in the afternoon with GOP members of the House and Senate to celebrate passage, White House Press Secretary Sarah Huckabee Sanders said. The president is expected to sign the bill at a later date. Trump tweeted Wednesday that the tax cuts are "so large and so meaningful," adding: "This is a case where the results will speak for themselves, starting very soon. Jobs, Jobs, Jobs!" The Republican bill was initially approved on a 227-203 vote in the House Tuesday, with no Democrats supporting it. Twelve Republicans also voted against the measure. With Vice President Mike Pence presiding and Treasury Secretary Steve Mnuchin on hand, the Senate then voted 51-48 in favor of the bill. Again, with no Democratic support. "After eight straight years of slow growth and underperformance, America is ready to take off," Senate Majority Leader Mitch McConnell said following the vote. The bill, the product of negotiations between Republicans in the House and Senate, achieves longtime Republican goals, including a permanent reduction in the corporate tax rate to 21 percent from 35 percent that supporters argue will make American business more competitive overseas. Many pass-through businesses also receive a more complicated 20 percent deduction, which became a subject of fierce debate after the final bill added a provision likely to benefit real estate companies like Trump's. House Speaker Paul Ryan, R-Wis., lauded the bill during an interview with NBC's "Today" on Wednesday morning, reiterating the GOP's claim that cutting the corporate tax rate would allow American companies to create new jobs with the savings and rejecting criticism that companies would merely pocket the savings. "It's not a question of if, it's a question of how much they benefit," he said. The bill will "put the American economy in a better position," Ryan said, because "workers benefit, wages go up." "This is a big tax cut for families as well," he said. A day earlier, speaking on the House floor moments before the vote, Ryan said the legislation will "help hard-working Americans who have been left behind for too long." "Today, we are giving the people their money back," he said, adding that a typical family would get a $2,059 tax cut next year. Democrats opposed bill as a boon to the wealthy while offering little for the middle class, with House Minority Leader Nancy Pelosi, D-Calif., calling it "the worst bill to ever come to the floor of the House." There were a number of protesters in Congress on Tuesday, on both the House and Senate sides. Protesters interrupted the Senate's final late night vote numerous times, at one point shouting, "Kill the bill. Don't kill us." One protester interrupted Ryan in the House when he was speaking. The GOP bill lowers individual tax rates, including the top bracket to 37 percent from 39.6, while doubling the standard deduction and replacing personal exemptions with a $2,000 partly refundable child tax credit. It eliminates various deductions while limiting others on state and local taxes and mortgage interest. It also exempts larger inheritances from the estate tax, doubling the thresholds to $11 million for individuals and $22 million for married couples. The bill also has significant implications for health care, where it abolishes the Affordable Care Act's penalty for Americans who don't purchase insurance. The Congressional Budget Office estimates that change would lead 13 million more Americans to go without coverage after a decade and cause premiums on the individual market to rise 10 percent per year. On Tuesday, Sanders also defended claims by the president — which tax experts say are likely wrong — that his own taxes would go up under the legislation, saying the bill "certainly, on the personal side, could cost the president a lot of money." While Trump has bucked tradition by refusing to release his tax returns, he is likely to benefit from cuts to the top income tax rate and especially from a new 20 percent deduction for pass-through businesses that's favorable to commercial real estate companies. His family would also benefit from the bill's changes to the estate tax. "Yeah, the president will benefit from that (pass-through cut), but so many Americans benefit when commercial real estate becomes easier and more accessible," Rep. Matt Gaetz, R-Fla., told MSNBC on Tuesday. The ultra-rich fare well in the tax bill overall. An analysis by the nonpartisan Tax Policy Center found that 83 percent of households in the top 0.1 percent would receive a tax break in 2018 with an average benefit of $193,380. For the middle 20 percent of earners, the average tax cut would be $930. Over half the bill's total benefits would go to the top 10 percent of earners. While Republicans are enthusiastic about their efforts, the legislation is intensely unpopular with the American public, with numerous surveys showing voters skeptical they'll gain from its temporary cuts to individual rates in comparison to shareholders, business owners and the wealthy. An NBC/Wall Street Journal poll released on Tuesday found 24 percent of respondents support the bill, versus 41 percent opposed. And 63 percent say it was designed primarily to benefit corporations and the rich, versus 22 percent who say it's aimed at all Americans equally, and just 7 percent who say it's for the middle class. Separate polls by Quinnipiac, Marist and Monmouth this month found support for GOP tax efforts in the mid-20s, with other surveys placing it somewhat higher. "Republicans will rue the day that they pass this tax bill because it's so unfair to the middle class," Senate Minority Leader Chuck Schumer, D-N.Y., said Tuesday. "It so blows a hole in our deficit, it so threatens Social Security, Medicare and Medicaid. They will rue the day." Republican lawmakers argue that voters will come around to the legislation as members tout its benefits at home and taxpayers see gains in their own returns and in the broader economy. Trump boasted in a tweet on Tuesday that the stock market had risen in recent months. "I don't think we've done a good job messaging," Rep. Greg Walden, R-Ore., told reporters. "I don’t think we've gotten out there the specifics and the final bill has only come together in the last week or so." The White House director of legislative affairs, Marc Short, said Americans' opinion of the GOP tax plan would improve in the months ahead. "I think that is going to change, we will see once the economy continues to roar and people begin to see more coming in their paycheck," Short said Tuesday on MSNBC. 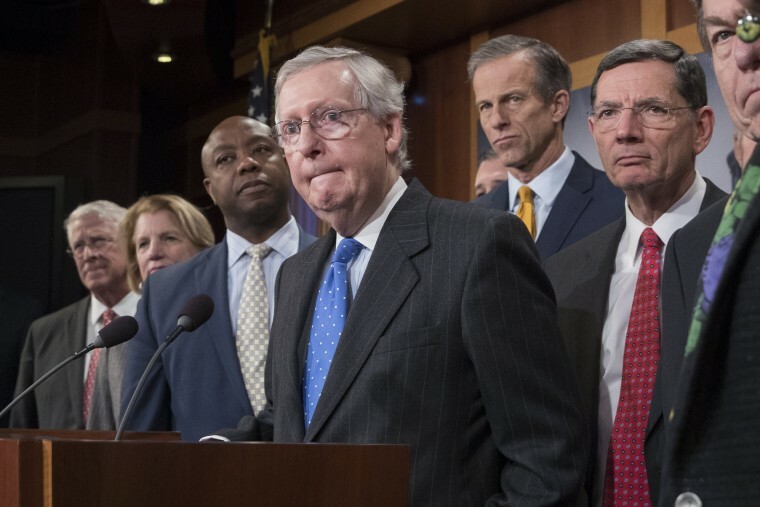 The Joint Committee on Taxation, the official congressional scorekeeper, estimates every income group would receive an average tax cut next year. But the JCT also found taxes would go up for lower incomes over time, in part because fewer eligible taxpayers would choose to receive health care subsidies through the ACA. By 2027, every income group making less than $75,000 would see a net tax increase. The nonpartisan Tax Policy Center, which did not factor in the health care changes, estimated that 80 percent of taxpayers would see a tax cut in 2018 and 4.8 percent see a tax increase, with many low-income households seeing little change either way. But the portion of taxpayers facing a tax increase would rise to 53.4 percent in 2027, when the bill's temporary tax breaks expire. Republicans argue future Congresses will extend those breaks. Frank Thorp V and Monica Alba contributed.